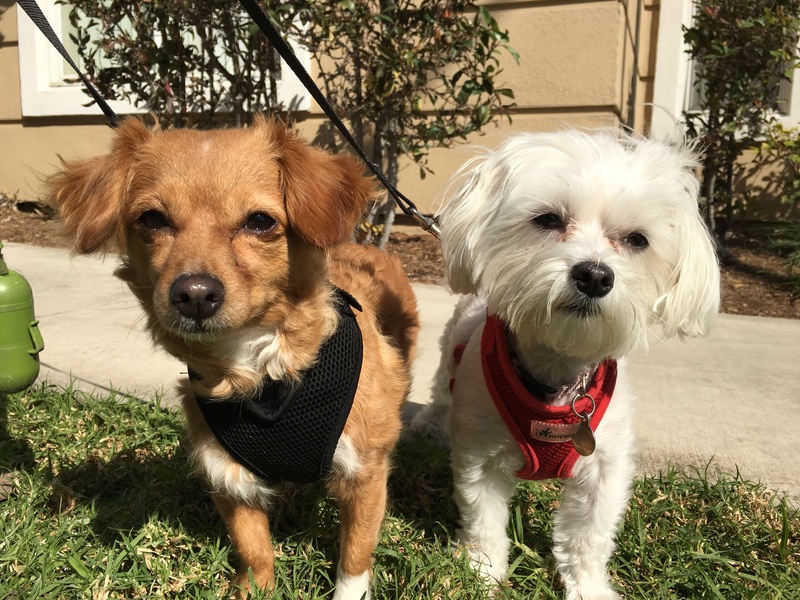 Abby (left) is a Chihuahua mix who lives with a Maltese named Luna in Marina del Ray, California. In this dog behavior training session I worked with Abby who is an anxious dog fearful of new guests and people she doesn’t know; barking, lunging at and nipping them if they get too close. When you have a dog who is fearful of things they are uncomfortable with, they will often act aggressively to try to ward off the thing they are afraid of. Many people mistakenly interpret this as aggression, but in most cases, the dog will only bite if people keep approaching. So to stop dog nipping, people need to stop reaching for a fearful dog. Many people with rescue dogs think that removing all rules and boundaries are the best ways to deal with a dog who has had a checkered past. But in reality, dogs who have been rescued do better when there are clear rules and boundaries in place. This structure helps them think of the humans as the authority figures and instead of thinking they need to protect themselves, they can count on the humans to do it for them. Consistently enforcing rules like no furniture or no furniture without permission can help a fearful dog start to transition into more of a follower’s mindset. I also recommend that the guardian start petting Abby with a purpose to add a little structure to this very repeatable activity. By asking the dog to sit or lay down before it gets petted or attention, the humans can help the dog start to ask for attention instead of demanding it. Helping Abby see and think of her guardian as a leader can help her feel more secure by reducing any perceived stress that comes from the dog thinking its responsible. Security for the group is a job that is usually handled by one of the leader dogs so helping Abby learn this isn’t her duty will go a long ways towards helping her relax at home. Additionally increasing the distance between a dog and something it is reacting to is always a good strategy. I spent the next few minutes showing the guardian how they can establish an invisible boundary several feet away from the door to help Abby see its not her job while simultaneously reducing the intensity of her phobia. It will take some practice so I suggested that the humans who live there call or text one another when they are close to returning home. This will allow them to practice playing the part of a guest to help the dogs learn to display a new behavior. Because they get a call or text right before the person knocks, the human will be ready and able to respond with good timing. I also wanted to share a way that the guardian can help the dog start to build up a positive association with new people. Many people think petting a dog who is fearful is the best approach, but in reality, this usually only increases a fearful dog reaction. I always look for ways to increase the distance for this type of encounter. I pulled out some treats and spent a few minutes going over a technique I have used successfully with many fearful dogs in the past. This kind of positive dog training is super easy and supremely effective when you have a fearful dog. Increasing the distance helps the dog feel less cornered which is important for dogs who always want to feel like they have room to maneuver or move away. This feeling of empowerment should not be underestimated when it comes to rehabilitating a fearful dog. Introduce new rules and boundaries and consistently enforce them within 3 seconds. Train Abby to use the dog bed with a command word. Pet Abby with a purpose to help her start to transition into a follower’s mindset. Train Abby to walk in the heel position instead of out front where she thinks she is a leader. Get Abby used to waiting and walking out doors behind her guardian. Make sure Abby is calm before heading out on a walk. Use Escalating Consequences to disagree any time Abby crosses a boundary or breaks a rule. Increase Abby’s exercise before any guests visit to help her relax faster. Practice claiming the area around the door as detailed in the first video. Have guests drop treats on the floor as they enter as detailed in the above video. If Abby is lunging at or barking at guests, use the leash to give her a leash time out. Ask guests to avoid looking at or trying to pet Abby. Instead they should ignore her and drop a treat at their feet when she approaches (preferably to the person’s side).